Pastoral ministry is always a mix of joys and sorrows as we participate in God's transformation of His people. Every pastor will face unique challenges and temptations that require wise counseling. The best counsel comes from someone who understands church ministry and is seasoned in biblical counseling. 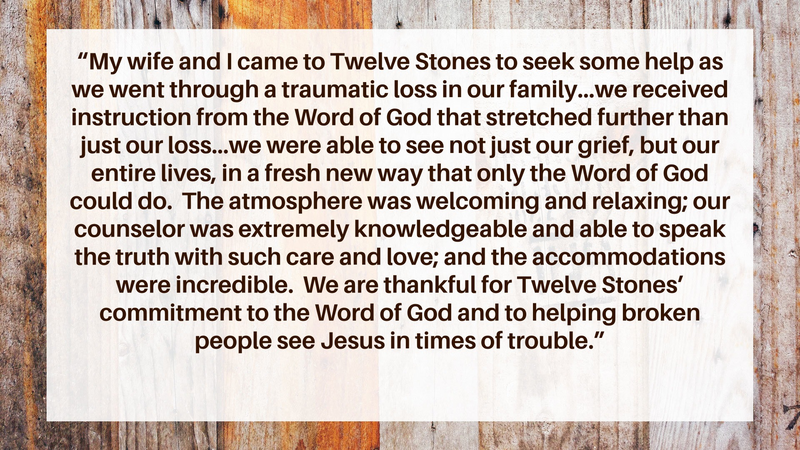 That is why Twelve Stones Ministries has partnered with Paul Tripp Ministries to create a space where pastors and their families can receive compassionate care that is discrete, and embodies grace and truth. We don't just serve the pastor but his family. Our counselors love the local church and understand the unique temptations and trials those in vocational ministry experience. Those burdens are not only carried by the pastor, but also his family. That is why if a pastor is married he should plan on bringing his wife, even if the focus is not related to marriage difficulties. Ideally arrive by 7:00pm for prayer and orientation (have dinner before coming). There will be approximately six hours of counseling per day, along with guided assignments to complete with the advocate(s) in the evenings. This is typically a half day with a central focus on application and building a care plan going forward. To fully absorb the lessons from your time we suggest not rushing right back into the busyness of everyday life. Therefore, we welcome you to stay another day or two for prayer and reflection. If you desire to stay late Friday or through the weekend just check availability with TSM staff. For a pastor and wife coming with their advocates, the total cost is $3,000. It includes an average of 15 hours of counseling, housing (well furnished retreat home), and food (eight meals for up to 6 people). Often a church will pay part or all of the cost for its pastor. We offer limited scholarships on a case by case basis for those in financial hardship. Finally, a payment plan can be set up but we do require a minimum $500 deposit to secure your dates. Ultimately, our goal is not only to get pastors and their families healthy but also to impact the churches to which they are returning. For this reason, the advocates are often a huge part of the aftercare and follow-through. When appropriate, we will send a consultant or team skilled in church health to help with the pastor's transition back into leadership, and/or help facilitate the staff/elders relational dynamics.